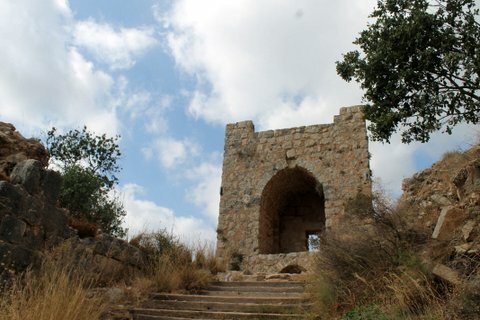 …visit the Montfort Castle in northern Israel. As my contribution to the Field Guide to Everyday Magic Blog Hop, I’m sharing how I finally did so because I have found that making magic happen is often a matter of following through and actually doing what I said I wanted to do. 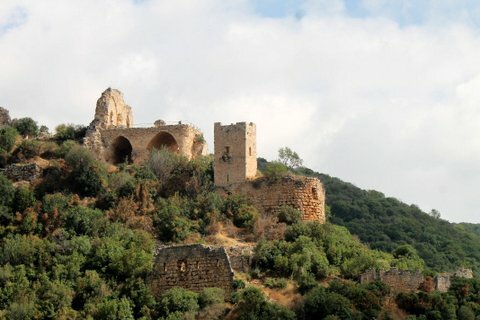 So, I always wanted to see the Montfort Castle in northern Israel; I have a thing for the medieval castles of knights, perhaps because I grew up visiting all the castle ruins along the Rhine with my grandmother. 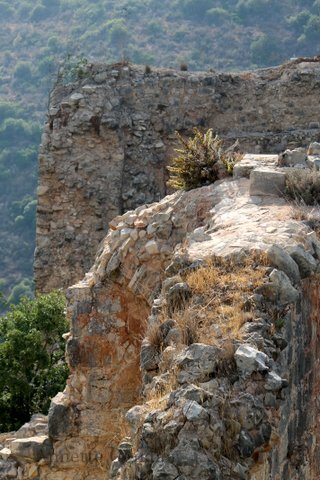 Even though I’ve been to Israel many times, I never made it to Montfort. 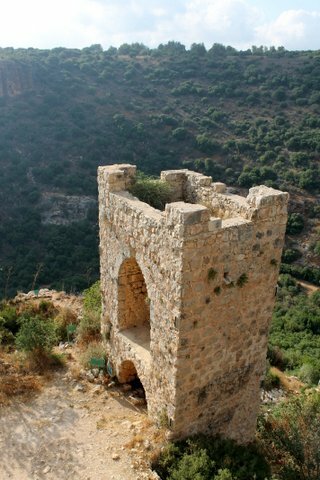 This Crusader ruin is remote, in the mountains of the Upper Galilee, close to the Lebanese border. None of my road trips ever took me close. 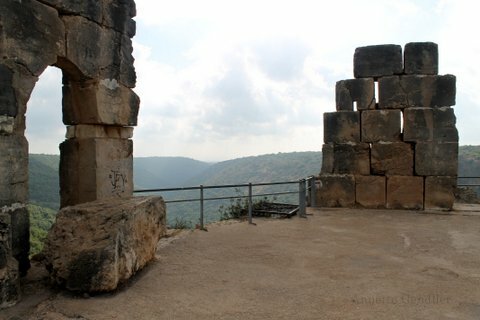 Well, my first trip to Israel kind of did but my husband (boyfriend then) was in charge of itinerary details, while I simply insisted that it would be cool to travel along the border with Lebanon, given that this was 1986 and the first Lebanon War had just “wrapped up.” This 1986 journey along Israel’s borders is chronicled in the “Israel” chapter in my book Jumping Over Shadows. Another problem with my plan was the Israeli summer. Not that I didn’t know about that, but the weather forecast predicted it wasn’t going to be exceedingly hot, i.e. “only” 28 to 30C (86-90F). In Israel, in the summer, that’s not exactly hot, but it is hot! 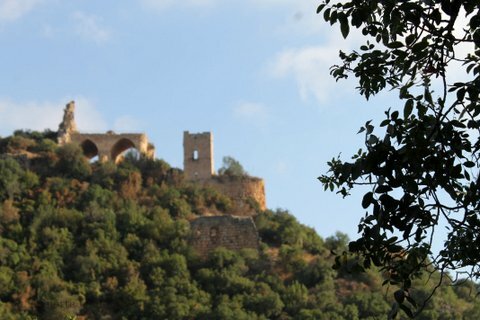 As soon as we got out of the car in the blazing sun and spotted the castle from the parking lot, my son began arguing that this was good enough and no way did it make any sense to hike down the valley and back up again in this heat, only to poke around a few old stones. Plus, you can see everything you need to see on Google. Oh yeah? but you can’t experience it, I argued. Ah, no, I was not going to back off now, and so we made our way down the trail. 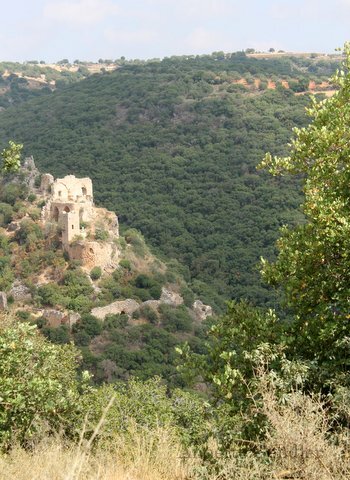 I loved how the view of the castle changed as we got lower into the valley. I kept busy with my camera, while my son stumbled ahead. Mind you, the trail was rough and involved a lot of groping from rock to rock. I had to pay careful attention to where I placed each foot. Half way down, as my head heated up, my heart beat faster, and I was wiping the sweat of my brow, I started wondering: Should we turn back? Was this sheer madness? I had suffered heat exhaustion two summers ago in Israel, and I did not want to repeat that experience. 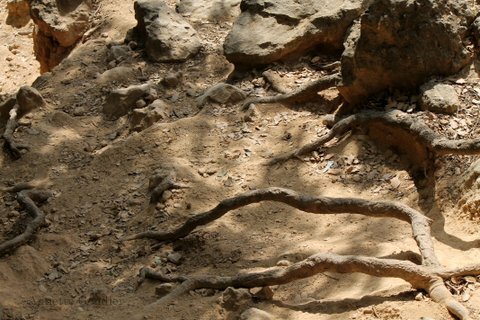 Were my thighs strong enough to make it down this rocky trail, up on the other side and repeat the whole thing to get back to the car? Did we have enough water? The trail description said the hike was less than an hour, so it sounded doable. But was it? 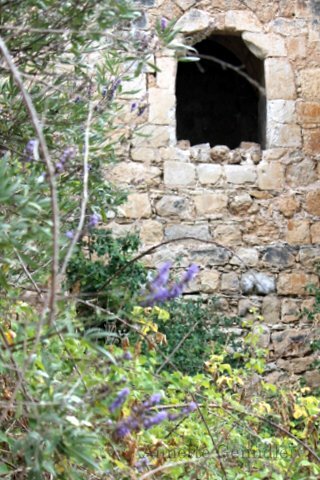 A ruin of what looked like a customs house met me in the valley (Yeay! I made it to the bottom! ), but the river bed was dry. No refreshing water in sight! Around a bend I found my son sitting in one of the few shady spots, sucking water out of his Camelback and seemingly on strike: “This is what I do in the army all day! Sweat and be hot!” Was I being unfair? Ruining his weekend off? 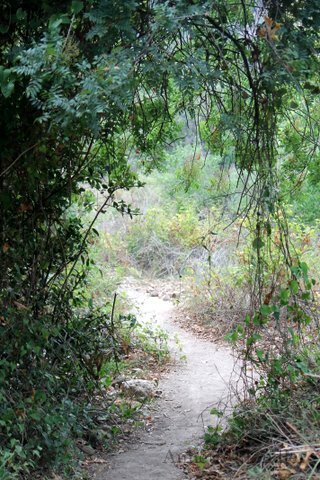 I wasn’t sure if he would keep going, but I pressed on, now that I’d completed half the hike there, I was going to go all the way up, even if I had to stop every few minutes to let my thumping heart quiet down and sip some water. All the while I wondered whether I would regret having stuck to this adventure, whether I’d end up in bed with a massive headache for the next two days. I climbed the rest of the way alone in the snickering heat. It was so hot I felt I could hear the heat. And then, finally, my first glimpse of reaching my destination! In the fortress I found a spot where I could sit in the shade of a column. 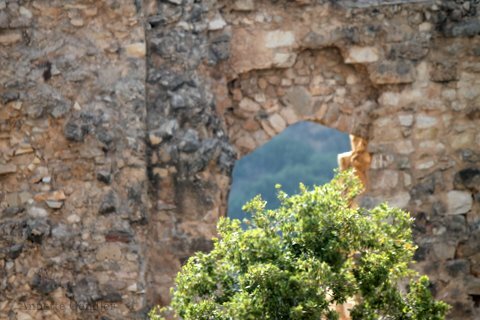 I leaned against the old stones, unwrapped the pastry I had brought along from the hotel breakfast buffet, gulped down my warm water, and tried to take in this view. 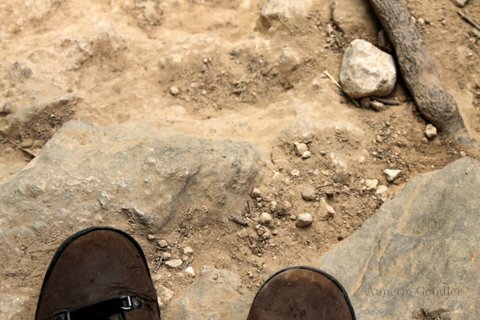 As I sat there, I wasn’t sure if my son would ever join me, whether what was supposed to be a fun family hike would end up in a quagmire of uneasy feelings. But, I was also proud of myself. I had made it! Sitting in a shady spot in Montfort was a little physical triumph. Life, after all, is not lived on Google. Slowly, my body cooled off a bit, and guess what? My son showed up with a smile on his face! 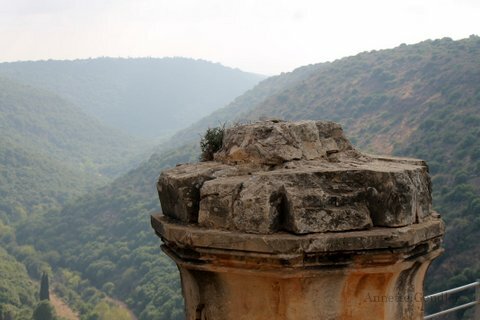 He joined me on my perch, and we had an amiable picnic, talking about old stones and the sheer craziness of those Teutonic monks who fortified this location back in the 12th century. My heart was wide with joy at our good fortune of having the luxury to spend a day together on a somewhat crazy quest and thankful for being able-bodied enough to undertake it. Then, somewhat recovered and feeling human again, we poked around. At this point there was no one else up there besides us! Seriously, we only ran into one other hiker and a bunch of kids up there. Beyond these mountains, we felt we could see the Mediterranean glitter on the horizon, but we weren’t quite sure. In this picture it disappears in the afternoon’s haze. 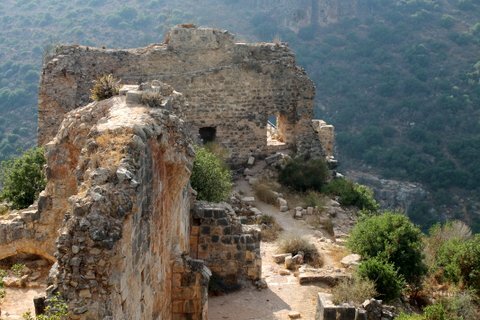 The terrace jutting out onto the cliff with its massive columns reminded me of Masada, an even more unlikely location for a stately castle. 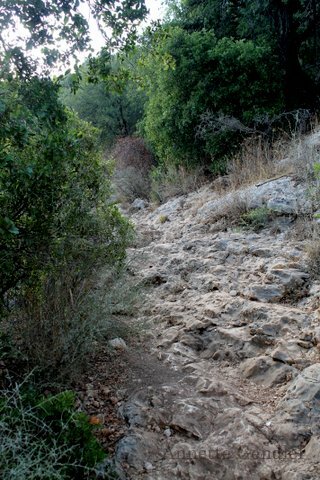 This is the rocky trail back up. On the way back, we had even better views of the castle in the glow of the afternoon sun. My son was in a much better mood now. I have often found that to be the case, not just with him but in general: Once we’ve accomplished a goal, however harebrained it might have been, we feel good about ourselves, and we don’t doubt the world as much. That’s a feeling you can’t get from Google either. I’ll be damned, I thought, happy that I had stuck to my original plan. And: I made it to Montfort. PS: Don’t forget to leave a comment about how you stuck to your guns (or will!) 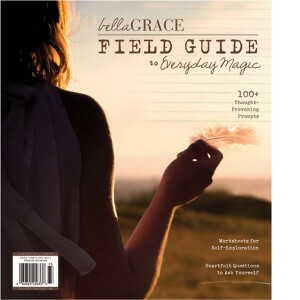 for a chance to win a copy of the Everyday Field Guide to Magic! I have created a bucket list of visiting every town in my state, not just driving by at 80 mph, stopping and walking around. I begin this journey this week, traveling back roads, slowing down and enjoying the view. I loved this tale of persistence and following one’s intuitive sense of what would enthrall and delight you. My own such story has to do with a hike to Cape Split, one of the seven wonders of Canada, five miles out and five miles back on a rough trail with other people in our sixties — but the rewards at the end are magnificent: a view of the world’s greatest tides from the perspective of a 250 foot high point. Oh wow! That sounds magnificent! I love your story! I had wanted to visit New Zealand for a long time but just never seemed to have the time/resources. Things just never fell into place. My sister-in-law wisely suggested that they probably never would, and the only way to make it happen was to set a date and start making plans. I did exactly that,saved money, made reservations, researched what I most wanted to do/see, and the following year had a wonderful hiking/relaxing 3-week trip to New Zealand with my husband! It was an incredible experience! Good for you! One definitely has to work on making dreams happen. Hiking a mountain has been on my bucket list for a number of years. This past March my husband and I hike Mount Dun in New Zealand. I am delighted to have crossed that one off my list! Good for you! Sounds like a great adventure! I have no single grand goal. It seems my need to create overwhelms my existence. I see ideas. I have ideas. I gather supplies. I begin and eventually complete most projects. If I had to narrow this to one dream, it would be to use my supplies so my children don’t put them in a dumpster when I am gone to Heaven (which is my ultimate goal, after all). That’s sounds like a good goal to me, it doesn’t always have to involve adventure! I’m with you Marcia! Besides family -especially grandkids- my passion is creativity. I also have the same goal – to use up all my craft supplies but I am also an artist so I also want to use up all my art supplies! Thank you for sharing this adventure. What a wonderful memory you have created. What a wonderful journey for you and your son! I think my persistence is in creating a piece of artwork every day. Sometimes it’s a card or even just a doodle but always something! I try to use whatever I have on hand and it encourages my creativity even more. Thank you for sharing in the blog hop! How admirable that you manage to create something every day. I guess it depends on how you define creating. I have always found it hard to commit to something that I would do every day. I’d like to visit all of Pennsylvania’s State Parks. I’ve been to many but lots to see- when do I get to retire? I need some more free time! Sounds like a tall order, but certainly doable! I hope you have a list going? Thank you so much for sharing your story. My favorite part was when you decided that turning back was Not an option! even if you had to go it alone. How many times do we come close to our dreams, only to give up on the way, convincing ourselves that we are not strong enough, good enough, or just enough? Every journey starts with a dream, and a step in that direction… It is easy to take the first step, only to convince ourselves not to follow through. “Faith is taking the first step, even when you don’t see the whole staircase”. One of my most coveted dreams is to appear in the pages of Where Women Create magazine. This year, I have had my art work featured in the Winter, Spring and Summer issues of Jewelry Affaire (will also be in Autumn) and the August issues of Green Craft, Somerset Home, and Altered Couture… I am on my way, and will not stop Believing! One of the best things that has happened throughout the process are the friendships and comradery that I have been blessed to share along the way. I have found that the journey is the fruit that we get to share on our way to our dream! Hope to someday share my story with you! Thank you for your long comment – I had a similar dream like you have with getting into “Where Women Create,” I wanted to published in Artful Blogging because that magazine had changed my career as a writer and had launched me into photography. I had my work published a few times in Bella Grace, which was the first step, and after submitting to Artful Blogging a few times and not even getting a response, I finally did get published there last year! So, keep plugging way! You will make it! Nancy and Annette, inspired by you two! I also dream to get published in Stampington Magazines. I will definitely work on it. Thank you! Yeay! Keep up the good work and keep on trying! Loved your inspiring tale. My goal is to visit England as I’m a literature & history buff. I’ve had some setbacks, but I know I’ll get there eventually. I always wanted to see a total eclipse and am going to next week! I have a goal to start my own business. I’m taking steps to make that happen and I won’t give in to the road blocks. I’m going to do it! I just wrote in my journal, before I read your inspiring story, my goals are to climb Mount Kilimanjaro and to to go to Matchu Picchu! Nothing is going to get in the way of my goals now! Thank you for sharing your story and persistence. Yeay! What a fun coincidence! Mt. Kilimanjaro and Matchu Picchu are much loftier goals than Montfort, but off you go! Dream of going to Hawaii. My brother and his wife went, rented a house for a month and invited us. We went and were able to do some awesome hiking to several wonderful beaches! Awesome! Good for you that you took the opportunity and actually went to Hawaii when you had the chance. Anab, thank you for your thoughtful comment. Pushing through is indeed the hard part when you reach that point where you feel you’re alone and you can only trust in yourself. Sticking with the small incremental steps is definitely the way to make progress, so keep with that! I haven’t heard of this place before. Splendid shots! Thank you for sharing. Thanks, William, glad you enjoyed the pics! Sorry it took me so long to respond, but I’ve been so busy with “real” life, which is a good thing. Best wishes to you and your husband! I hope you will be able to do the Superior Hiking Trail again next year, together! I feel a yearn to return to the sea. It feels like MY place. I feel calm when I sit down and watch waves, sunrise … And frankly I do not feel calm often in my life. So memory of the sea takes profund place in my heart. I long for it and know that when I’ll be able to back there, sit and just be, I’ll find a bit of magic for my life. Sorry it took me so long to respond – I’ve been busy with “real” life (family visits!) but also always try to allow time for calm moments. I hope you can return to the sea soon, it is so soothing, isn’t it? Unless, of course, nature unleashes its formidable power, as it does with hurricanes, so we always have to be on guard. I’m lucky in that I live by the inland “sea” of Lake Michigan, which has its own wild waves, endless horizon, and ever changing nature. Thankfully, no hurricanes!